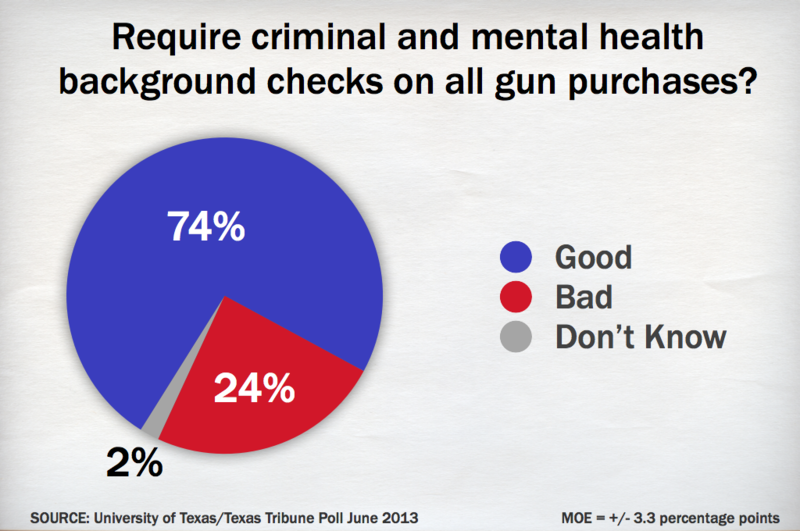 Support for criminal and mental health background checks on gun purchases is overwhelming in Texas, but voters are split when it comes to carrying concealed weapons on college campuses, according to the latest University of Texas/Texas Tribune Poll. Nearly three-quarters of Texas voters said they would support background checks on all gun purchases in the U.S., including at gun shows and for private sales. A solid majority of 57 percent strongly supports such checks. Of the 24 percent who oppose the checks, 14 percent strongly oppose them. And just about everyone has an opinion — a scant 3 percent said they don’t have an opinion. Allowing faculty, staff and students to carry concealed handguns on college campuses is supported by 46 percent of Texas voters and opposed by 48 percent. The most strongly held opinions are on the negative side, with 34 percent strongly opposing campus carry and 26 percent strongly supporting it. “While we have a strong amount of support overall, we saw Republican support for background checks drop and opposition increase, which is almost certainly attributable to the partisan framing of the issue,” said Jim Henson, co-director of the UT/TT Poll and head of the Texas Politics Project at UT-Austin. The partisan breakdowns are striking, particularly on campus carry: While 73 percent of Republicans support it, only 45 percent of independents and 16 percent of Democrats do so. Only 20 percent of Republicans are opposed, compared with 42 percent of independents and 79 percent of Democrats. 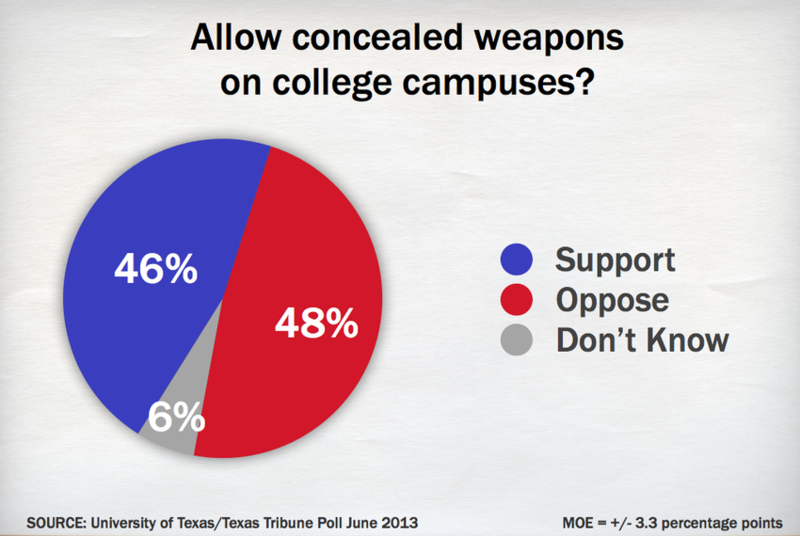 Carrying concealed weapons on campus is more popular with Texas voters who attended college than with those who haven’t, and more popular with undergrads than with those who have some post-graduate education. High school graduates were about evenly divided, those with “some college” favored campus carry by about 12 percentage points, those with two years favored it by 14 percentage points, and those with four years of college were evenly split. The post-grads oppose campus carry by a margin of 15 percentage points. A plurality of Texas voters — not quite a majority — said immigration is, on the whole, a good thing for the country. And they would be willing to grant legal status to children illegally in the U.S. in return for military service; 65 percent support that notion. Less than half — 47 percent — would be willing to convey legal status to illegal immigrants brought to the U.S. children for going to college. Almost half of Texas voters said they would support a pathway to citizenship for most illegal immigrants living in the U.S. now, but 41 percent oppose that policy, including 29 percent who strongly oppose it. 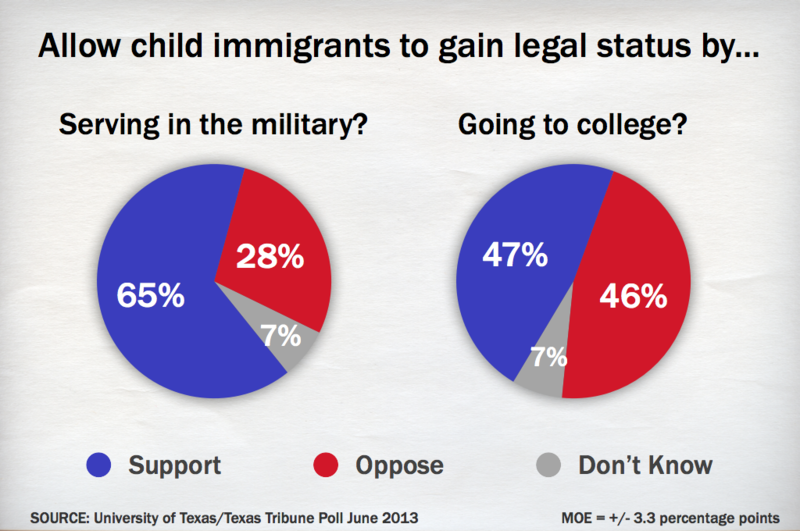 As with some other issues, there is a partisan divide in Texas on immigration. For instance, 64 percent of Democrats said immigration is, on balance, a good thing, but only 35 percent of Republicans think so. Conversely, 52 percent of Republicans said immigration is a bad thing, while only 15 percent of Democrats thought so. Independents were split, with 38 percent saying immigration is good, and 42 percent saying it is bad. How far can a Republican stray from conservative voters’ antipathy to pathways to citizenship? “That seems to be the logic that is driving some of our most ambitious politicians in the Republican Party right now,” he said. Most Texas voters said gays and lesbians should be able to form legal relationships, with 39 percent saying they should have the right to marry and another 30 percent saying they should have the right to civil unions but not marriage. About a quarter — 26 percent — said gays and lesbians should not be able to marry or to form civil unions. The issue clearly divides Democrats and Republicans, with 64 percent of Democrats saying gay and lesbian couples should be allowed to marry, while only 15 percent of Republicans say so. And while 36 percent of Republicans said those couples should not be allowed to marry or to form civil unions, only 17 percent of Democrats held that position. The biggest cluster of Republicans — 45 percent — said they favored civil unions, but not marriage. Collecting a public pension and a state paycheck at the same time is a no-no with 75 percent of Texans, who support a ban on that policy. That includes 60 percent who strongly support a ban. Gov. Rick Perry is the most prominent example of someone who does that; he revealed, in financial filings during his presidential run, that he is collecting his state pension even though there has never been a break in his state salary. Only 16 percent of Texans would oppose a prohibition. Voters want to see disclosures of income and finances from their state elected officials, saying it’s more important to see whether they have conflicts of interest than to protect their financial privacy. Given those choices, 58 percent said the disclosures are appropriate, while 23 percent said the disclosures are an invasion of privacy that goes too far. One in five were undecided. Political redistricting — a debate going on right now in the Texas Legislature’s special session — ought to be taken from lawmakers and instead given to an independent, appointed commission, according to 43 percent of Texas voters. Another 28 percent oppose it, and a large group — also 28 percent — said they didn’t know which alternative they’d prefer. This is the last of five stories on the latest University of Texas/Texas Tribune Poll. Monday: head-to-head races for president, governor and lieutenant governor. Tuesday: what voters think of top political figures and institutions. Wednesday: voters’ take on the most important issues and the economic climate. Thursday: issues and the Texas Legislature.